This configuration of a 23-man roster takes up $78.6M of cap space (including penalties the Kings are paying next season for terminating Mike Richards’ contract and buying out Matt Greene). With the 2018-19 NHL salary cap limit set at $79.5M, that leaves Blake & Co. just shy of $900K of “extra” money. Remember, the recently announced Drew Doughty contract extension does not kick in until the 2019-20 season. Thus, his $4M raise is something they’ll need to deal with next summer, even if the cap goes up again in 12 months. 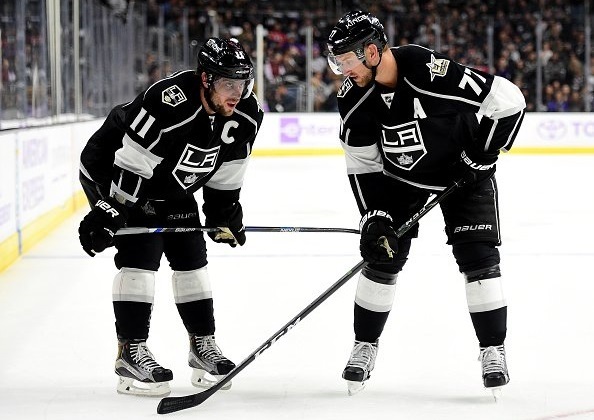 If one of their younger defensemen can step up and earn a full-time role with the club between now and then, that could make somebody like Jake Muzzin or Alec Martinez a piece to keep an eye on at that point. Currently, Muzzin has two seasons remaining at an AAV of $4M. Meanwhile, Martinez has three more seasons remaining at the moment, also at a $4M AAV. – On the Slava Voynov front, everything remains the same. Despite him clearing an important legal hurdle this week, it doesn’t appear like he will play for the Kings again. They own his rights, but don’t seem to be in a hurry to do anything about it. Instead, they’re going to wait until after all facts are known (i.e. until after Voynov meets with NHL Commissioner Gary Bettman, who will determine if the defenseman will be reinstated, and if that will come with any additional discipline). At that time, look for the Kings to deal Voynov. For what? A third round pick? We’ll see. 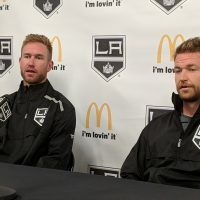 – Stevens says his plan is to play Adrian Kempe at 3C. 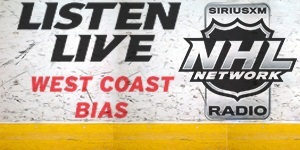 … There is not much appetite within the Kings management team to trade Dustin Brown. … Top prospect Gabe Vilardi is expected to start his NHL career at wing before possibly moving to center at some point down the road. … Dion Phaneuf would be a buyout candidate next summer, prior to the expected Expansion Draft for Seattle. Again, that’s a debate for 12 months from now. – Nothing has changed surrounding the topic of Paul LaDue. 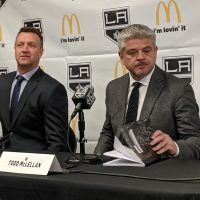 We’ve been telling you for months that the Kings believe he has a spot on next year’s team and Blake confirmed it once again on a media conference call this past weekend. LaDue was on a one-year deal last season at $874,125. The number used above represents an automatic 5% he is guaranteed after receiving a qualified offer from the club as a Restricted Free Agent. It isn’t official until after he’s inked a new contract. And while there is always the possibility of him signing a longer term deal for more money, expect him to play on a ‘prove it’ deal in 2018-19 and then sign a better contract next summer. – Defenseman Oscar Fantenberg signed a one-year contract extension in May. We previously took a deep look at his possible on-ice contributions and potential future with the organization in an article here. However, the addition of top college free agent Daniel Brickley has likely pushed him down to No. 8 on the depth chart. 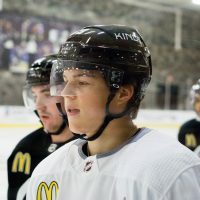 While Fantenberg’s play was acceptable during his 27 games with the Kings (and another 25 GP with the Reign), adding him to LA’s mix of seven blueliners for the upcoming campaign looks to be a reach. Working in his favor is a very affordable contract next season, carrying an AAV of just $650K. Yet, he’s a left shot, something they already have an abundance of at the moment. For the 26-year-old Swede to force his way onto the opening night roster he’s probably looking at a situation where he needs to beat out somebody ahead of him on the depth chart or hope that a trade happens in the coming weeks. – If the Kings are interested in adding more offense up front, Jeff Skinner is still an option via trade. However, he’s a UFA next summer and everybody we’ve spoken to inside the Kings front office has been saying the same thing – they aren’t looking to trade a group of key assets for a rental player. As we noted in previous articles, they certainly weren’t looking to deal this year’s first round draft pick. Overall, they don’t want a repeat of the Milan Lucic situation, where they traded away three assets for a one-year rental. – Max Pacioretty is another option. Montreal is said to want a center in the deal. If you take Vilardi and Kempe off the table, you’d most likely be looking at a package like this to make it work from the Kings side. – Have you listened to our latest edition of the MayorsManor Live podcast yet? If not, you owe it to yourself to click over and give it a spin. 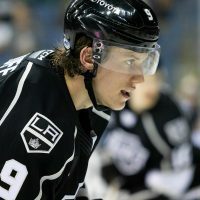 We thoroughly discussed the Kings trade options; including reasons why a package of Derek Forbort, Jonny Brodzinski, and a 2nd (or 3rd) round draft pick makes the most sense if Blake tries to get creative this summer. For starters, Brodzinski has been somewhat squeezed out of a top-9 role; making him a prime trade candidate. Add in that they somewhat replaced Forbort (or Martinez) with the signing of Brickley, and the picture starts to become a bit clearer. – Top defensive prospect Kale Clague is probably at least a year away from being NHL ready, expect him to start the season in Ontario (see here). – There are no other prospects expected to make a major push for the NHL roster. Most of the prospects on the bubble are already on the list above (i.e. Amadio and Brickley). If you’re really into looking at a possible stretch in this department, maybe Kurtis MacDermid finds a way into the blueline conversation. 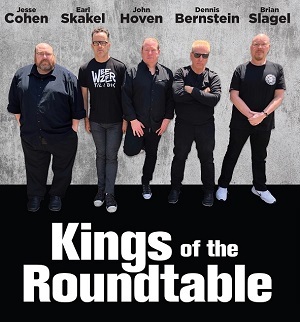 Kings realistically have a 1-3 year window to make a run. Injuries will have a major impact but ultimately it is Blake’s job to figure out how to make that transition. He is really in a pretty good position to be able to turn over the roster without crashing into the rocks. He will need to start moving the right pieces to restock starting later in the year. Winnipeg wins the cup this year with Quick in the net. What east coast playoff team wouldn’t take carts at the trade deadline? There are pieces to move and deals to be made in the next few years. Not now.